Has anyone ever asked you "What is All Star?" They think it's like sideline cheer and dance for high school and college. And you say, "sort of, but All Star is different." Well, let's tell the world what All Star is! Tell YOUR story of the ABC's of All Star through your social media channels using the hashtag #ThisIsAllStar. Tell all your teammates and your social media friends to join the fun, too, using the ABC's and AAA. Each week, USASF will present you with a new challenge. To participate in the contest, share your pictures and videos that highlight the weekly challenge and don't forget to use #ThisIsAllStar. Then tag your friends and have them do the same! We'll be tracking the use of #ThisIsAllStar through Instagram, Twitter and Facebook. This contest will continue through the entire season, so post now, post often, encourage your friends to post and keep the momentum going! 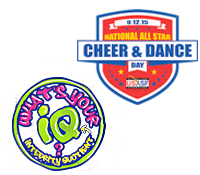 Athletes with the most reach and engagement with effective messages that hit the ABC's of All Star (see below) will receive recognition through USASF social media channels, cheer and dance magazines and our media partners, at events during the season, including Worlds. Tell your story through videos and pics of your team in the gym conditioning and learning new skills, talk about the commitment and dedication it takes to be an athlete – and the fun you have as a team while you're at it. What makes you an athlete? Share about the BFFs on your team. Highlight team talk circles, hugs, smiles and laughs…maybe your coach is giving you a pep talk or you're leading a group of younger athletes in games and activities. What if results and rankings were the last thing you posted about? What if you post about how you worked hard in warmup or traditions your team has before you go on the floor – do you have a chant or a saying or a team prayer? Does your coach or team leader give you a pep talk? Who came to support you? Your parents? Grandma and Grandpa? Your little brother or sister? Take a pic and give them a shout out on social. What fun, special or inspiring moments did you have in the car, bus or plane ride on the way? Comp is about the whole experience, not just the result.